When I’m browsing on dpreview.com and checking the latest camera gear discussions, I often like to check the photo challenges on the site and see if I have a photo that meets any of the themes available for submission. As long as there is no date taken requirement, I’ll just go through my archives and find the one that best fits. I do it entirely for fun and generally don’t take it too seriously. I often fail miserably but have had a few successes, landing in the top ten on occasion and even a first place finish. So when I saw a photo challenge for a postcard style photo, I immediately went to my files of Miami photos. 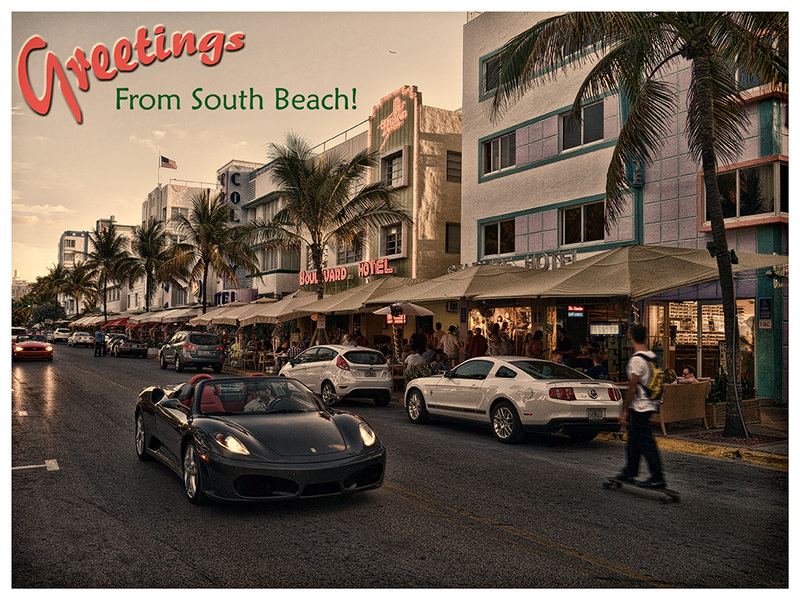 At first I was going to use a beach scene but I thought that was too normal, so I decided to use this street scene in South Beach instead. Just like to be a little different in my approach – something that doesn’t always work in my favor, but it’s just for fun so, who cares? What made me want to try the challenge in the first place was that I had a request from a co-worker to help design a logo for his volunteer fire department website and my “texting” skills in Photoshop have been way under-utilized (as in not at all) for a long time. I figured I better practice a little before I attempted anything serious. Although I still need practice after this exercise, I feel a little more confident to start pounding out some ideas for him. Nice work – it does look like a photo postcard! Thanks. I still need to brush up on my graphic design skills but, ya gotta start somewhere.